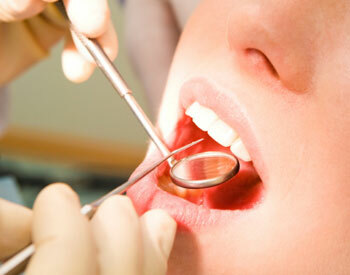 Our dentists will look for symptoms of teeth grinding and have solutions to protect your teeth. As we sleep, many of us squeeze, clench, and grind our teeth. Just a little each night can wear the tissues and enamel can wear down, changing the bite. Many times, people awake with sore muscles, a clue their mouths are actually grinding at night. However, many people don’t even experience symptoms, such as jaw pain, headache, or sore muscles in the morning and make no grinding noises while sleeping, but their teeth are being affected. 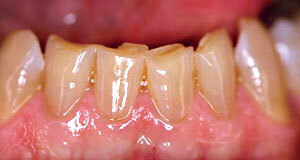 If we find evidence of premature wear on your teeth we will let you know. 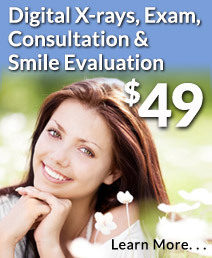 We have technologies such as oral photos that can show you the extent of the wear. Depending on the damage the wear has already caused, we will discuss what we can do together to manage, correct, or lessen the effects of wear. There are many reasons why people wear down their teeth, from stress to bite alignment problems, and even issues with how we sleep. Prevention comes in the form of mouth guards, which gently hold your teeth in position. In the photos below, you can see the damaging effects of grinding the teeth both during the day and at night while you sleep. Our dentists can detect if this occurring and can not only help prevent the wear with oral devices to protect your teeth, but can also correct the actual damage to your teeth with restorative measures. 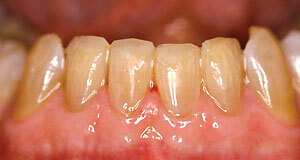 Before: Typical adult wear and chipping we often see on front teeth. After: Wear has been corrected with laser rejuvenation. Unfortunate wear on a 17 year old male with no enamel left. Another example of generalized wear and a crack in the metal filling. Wear causes shifting of bite forces. 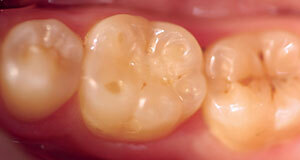 Loss of enamel and wear around the back tooth. Divots and holes in the enamel from night grinding of a 16 year old. If our dentists see evidence that suggest you are grinding your teeth they will let you know what your options are for protecting them. Mouthguards are very effective against teeth grinding while you sleep. 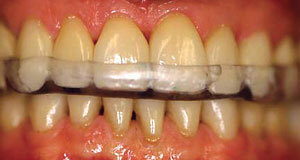 A Forced Management Guard (Night Guard) which prevents destructive wear on the teeth. 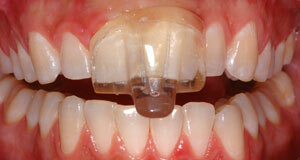 The NTI device is very effective in preventing tooth wear. More than 8% of the American population grind (bruxism), squeeze, clench, or rub their teeth together during sleep or while under stress or habit during the daytime. Results of sleep or daytime grinding can be tooth wear, jaw joint problems, morning headache, poor sleep, and daytime sleepiness. 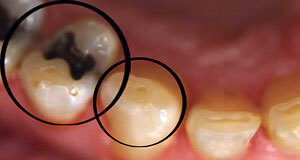 Few people ever seek treatment for this, yet it is an important strategy in keeping your teeth healthy for a lifetime. Do you clench your teeth strongly while sleeping? Does your bed partner complain that you grind your teeth while sleeping? Do you feel pain/stiffness/weariness in your jaw joint when you wake up? Do you have difficulty opening your mouth when you wake up? Do you hear a “click” sound when opening your mouth for the first time in the morning? 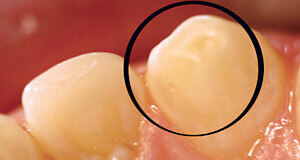 Did you notice or have you been told that your teeth are showing signs of wear? The Bite Strip allows you to test for teeth grinding while you sleep. Diagnosis of sleep grinding is best achieved by conducting on overnight sleep study that includes continuous monitoring of the jaw muscles that show repeated bursts of activity (muscle contractions) that are not present in people who don’t grind. The Bite Strip is a low cost, single use assessment and follow-up technology tool for sleep grinders. The device is used to determine both the existence and severity of night wear, for evaluating the long and short-term effectiveness of a treatment (such as a dental night wear guard), and for titrating drug dosages. Available in our office and mush less expensive than a sleep study, the Bite Strip is worn comfortably under your jaw on one side of your face for one night. The micro-sensors are then read by the doctor the next morning to determine the outcome and level of night grinding activity you have. Then the appropriate treatment can be scientifically determined and discussed with you. 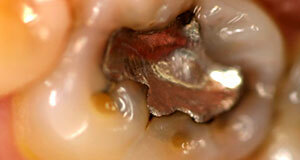 Much more successful treatment of wear issues is now available with this inexpensive new technology.